If you are trying to locate an affordable rented storage container in Salt Lake City, contact the storage experts at Haulaway Storage Containers. Don’t spend too much money paying to store your belongings in a remote storage facility. Try a rented storage container instead that can be delivered to your home, business, or worksite for substantially less money. Our containers are available in a large selection of sizes. We definitely have something to accommodate your specific needs. Our fast delivery is often as quick as the following day, meaning there is little waiting time for you to start your project. The 20’ and 40’ containers come equipped with our highly secure and patented Rhino Locking System. The custom built 21’ and 26’ containers have access doors on both sides, and are best for those that need better air circulation or easy access from multiple points of entry. There is no need to look out of town or state because you can find an affordable rented storage container right here in Salt Lake City. 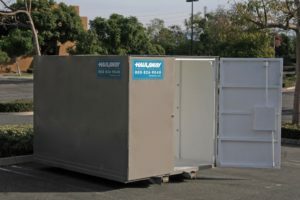 Give us a call at Haulaway Storage Containers today to receive a free quote for an affordable rented storage container for your home, business, or job site today. Whether you seek construction storage, shipping containers, office storage, retail storage, a portable tool shed, or residential storage, we have something to suit your needs.